Witnesses watching the signing of the MoU by University of Tasmania Professor Monique Skidmore and Professor Arnaud Poitou, Director of École Centrale de Nantes. Image: Patrick Roustang of Ecole Centrale de Nantes. The University of Tasmania has formally joined an international consortium which will help deliver Australia’s next-generation submarine fleet. Deputy Vice-Chancellor (Global) Professor Monique Skidmore said an MoU signed last week with four leading French institutions recognised the world standing of the University’s Australian Maritime College (AMC) in both teaching and research, and underlined the considerable promise of defence and design to Northern Tasmania’s future. “Arrangements such as this provide a platform upon which we can expand our existing strengths, along with the development of completely new economic sectors for the region and the State,” Professor Skidmore said. In 2016 the Federal Government announced that the nation’s Future Submarine Program would deliver the next fleet of Australian submarines, to be built in Adelaide, and appointed global advanced technology and defence company DCNS as the design partner. DCNS currently works with the four French signatories to the MoU - ENSTA ParisTech, École Centrale de Nantes, CentraleSupélec and École Polytechnique - each having a particular strength in advanced defence and maritime technologies. The universities will collaborate in the areas of research, design and knowledge-share relating to sub-sea engineering, submarines, hydraulics, hydrodynamics and wave energy; all key elements in Australia's future defence industries and energy security. “This MoU will result in the University working with our French partners to deliver teaching and research which will inform the delivery of the next-generation submarine fleet for the country,” Professor Skidmore said. Professor Arnaud Poitou, Director of École Centrale de Nantes, said: “This is more than a classical partnership – we share a common industrial partner in DCNS. “We have decided to collaborate as both institutions have strong maritime interests and we share this in the long term. This MOU is important as it gives a long-term perspective which allows us to grow something strong and enduring. With the establishment of a new inner-city campus at Inveresk, near Launceston’s CBD, the University aims to consolidate and build the AMC’s capability at its existing site, including the development of a defence and design precinct alongside the College. AMC Principal Professor Neil Bose said the University would seek to work with government and industry to bring that vision to reality. Tasmanian Liberal and Labor senators supported a motion in the Senate last month to note Tasmania’s nationally important defence capabilities and to recognise that the University of Tasmania, through the AMC, is the acknowledged Australian leader in maritime education in both technical skills and research. Last week, the Assistant Minister to the Prime Minister, Senator James McGrath, toured the AMC with Tasmanian Liberal Senator David Bushby, where he noted how well placed the AMC was to take advantage of research and contracts in the national defence industry. Professor Bose said there was considerable opportunity given the heavy focus on naval capacity in the 2016 National Defence Whitepaper, which provides a roadmap for Australia’s defence spending to 2035. “We believe that Tasmania would benefit from having a statewide strategy shared between government, universities and industry that aligns us more strongly to the national defence agenda,” Professor Bose said. 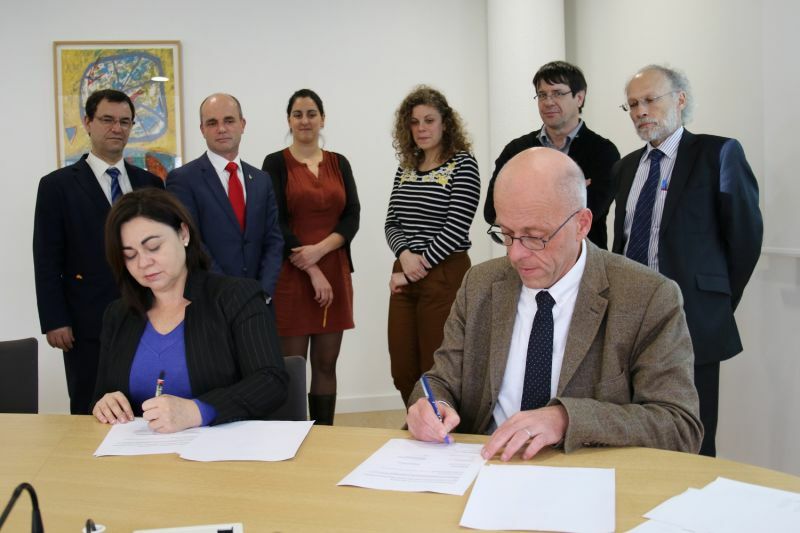 The Memorandum of Understanding was signed in Nantes.